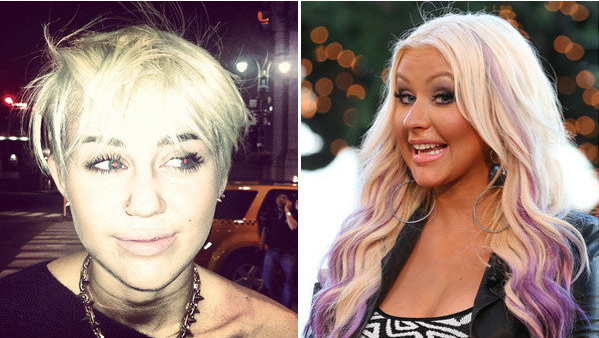 Miley Cyrus refuses to appear on The Voice because of feud with Christina Aguilera. Miley Cyrus‘ bitter feud with pop rival Christina Aguilera has made her turn down all offers to appear on her show The Voice, RadarOnline.com has learned. “Miley is no friend or supporter of Christina, despite the fact they have a lot in common, including long associations withDisney and using some of same people through the years on their respective business teams,” a source revealed to Radar. And although Aguilera is now pregnant and taking a break as a judge on The Voice this season, replaced by Shakira, “Miley is still resisting countless invites to perform on the show,” the source said. According to the source, Cyrus, 21, has been angry with Aguilera, 33, since the older star tweeted a comment about her revealing concert chaps in February. Most interpreted the comment as praise for the twerk queen, as Aguilera wrote, “Cheers from one dirrty girl to the next @MileyCyrus…wear em’ loud & proud, girl-yes!” with a picture of Cyrus in costume. But the source revealed that Cyrus believed Aguilera really wanted to point out SHE wore chaps to perform first! The source said the feud is making The Voice producers tear their hair out, because they badly want Cyrus to perform to boost the ratings on the hit NBC show even higher.